wanderlust ATLANTA: Atlanta Botanical Garden: Atlanta Blooms! One of the reasons I love Atlanta so much is springtime. The first annual Atlanta Blooms! 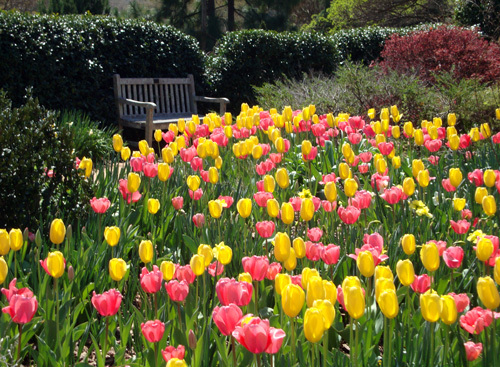 exhibition at the Atlanta Botanical Garden has added significantly to that love…the 200,000 bulbs and seemingly everything else in the Garden is in bloom! When I arrived, the entrance to the Garden was buzzing with activity…a sign that the turnout was good. The weather was perfect for a day in the Garden. Speaking of weather, I consider myself a "professional tourist," but in my haste to leave for the Garden, I neglected to apply sunscreen, which you really, really, really want to do, especially if you’re going to spend two hours exploring like I did on this visit. Fortunately, the Gift Shop sells sunscreen…just in case you forget to apply as well. Entry to the Garden went quickly. A stop by the "What's in Bloom" display in the Hardin Visitor Center showed me a unique tulip located near the Japanese Garden that I decided I had to see. Did you know that there's a theatre in the Visitor Center? There is! It's on the left just before you enter the Garden. Currently running is a video about orchids, in association with the Orchid Daze exhibition on display through Sunday, April 10. 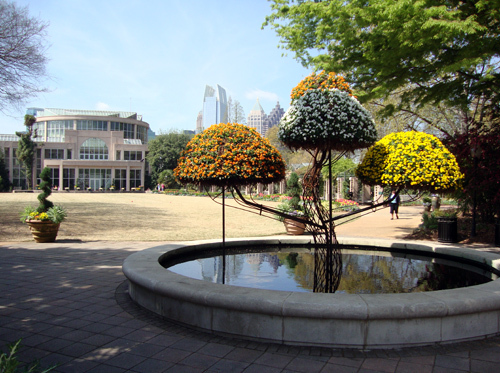 As you enter the Garden, you see several topiaries created just for Atlanta Blooms! 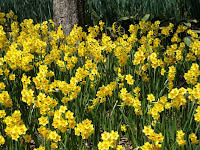 as well as hundreds of blooming daffodils. There are several other topiaries throughout the Garden, so be on the lookout. 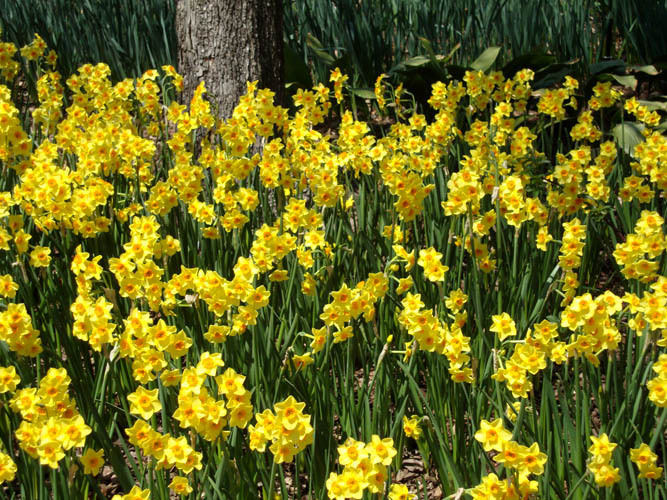 The daffodil explosion continues in the woodlands of the Southern Seasons Garden, which you pass on the way to the Canopy Walk. While there are no blooms "on" the Canopy Walk itself, it offers some great views of lots of flower beds at that end of the Garden. The Canopy Walk lets out the Cascades Garden, a great spot to sit and listen to the waterfalls and singing birds. 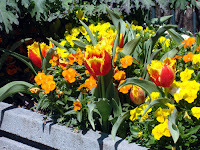 The tulip beds near Day Hall were continually occupied with shutterbugs and tulip enthusiasts…I stopped by several times myself. I used to be shy about asking other visitors to make a photo for me when I was touring on my own, but I've discovered that most people are more than willing to help you create memories. I asked a fellow visitor to make a photo of me among the tulips and I got lucky…the person taking the photos for me just happened to be a professional photographer. She was teaching her boyfriend how to use a camera, about composition, and positioning for optimum lighting…a very good teacher from what I could tell in our brief encounter. The Parterre Garden is a special place because of the Levy Parterre alone, but surrounded by ethereal cherry trees, tulips, crocus and excited tourists, makes being there an even more stupendous experience. The Rose Garden has quite a few bulbs coming up including a lot of pink tulips. 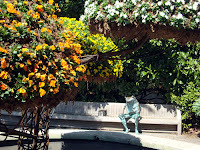 While making photos in the Rose Garden, I noticed quite a few rose buds, so I'm thinking that they'll be blooming soon. 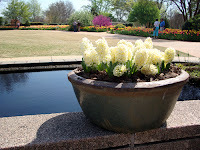 There are bulbs around the Japanese Garden, but I didn't see any inside, not a surprise. However, leaves on the maples are well on their, here and other places in the Garden. The Great Lawn is completely surrounded by blooms! 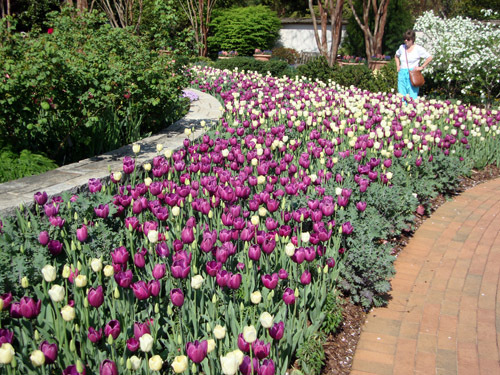 The Perennial Border is bursting with tulips, daffodils, and other bulbs and is capped with a rather large purple tree…at least its thousands of tiny blossoms make it look like a purple tree. It's actually a Don Egolf Rosebud. 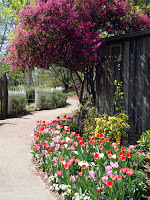 I'm very impressed that the Garden ensured that all parts of the Garden were included in the Atlanta Blooms! exhibition. 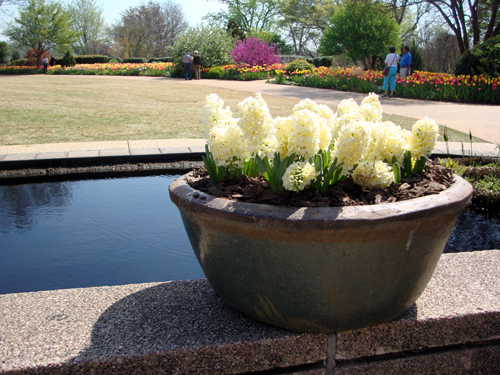 Even by the Aquatic Plant Pond near the Fuqua Conservatory there are bulb plantings and some quite beautiful and peaceful sitting areas overlooking Piedmont Park and the Conservatory. Over on the other side of the Conservatory, there are beds of tulips in the Edible Garden. There's also a rather tall gardener, rake in hand, standing atop one of the beds and she's covered with flowers. She would have remembered to wear sunscreen! The Perennial Gardens were getting a lot of attention on this day. 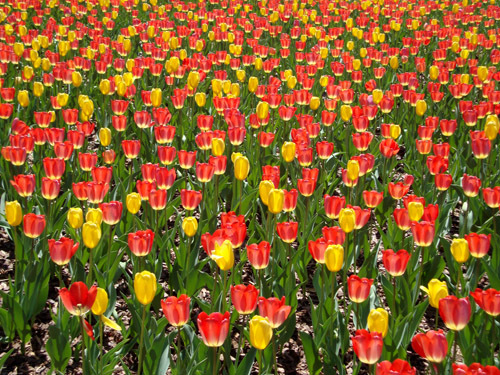 There are some very unique tulip species and a wide range of color. The wisteria is also coming in over the bench next to the fountain. 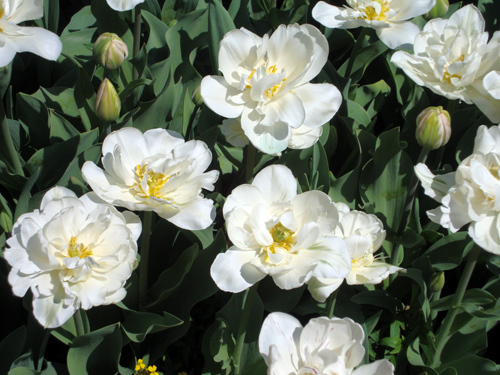 The white tulips in this garden are my absolute favorite of the 70,000 throughout the Garden. I wanted to see the entire Garden on this visit, to discover what was coming up where and what unique way our talented Garden designers decided to showcase the Atlanta Blooms! bulbs. 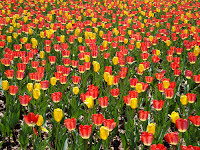 Over the Flower Bridge I went where I discovered my second favorite tulip in the Garden. It's bright orange and yellow and its petals have feathered edges…very cool! I love the architectural elements of the Trustees Garden. There is probably the least amount of bulbs in this garden, but you can see that a lot of the flowering vines will soon be in bloom. This is also a nice quite corner of the Garden if you need to escape from your escape. While visiting kids are probably more interested in the slides, tree house, and water features in the Children’s Garden, it is also peppered with blubs and other blooms. While strolling through, I heard a splash and turned to see two giant frogs swimming in one of the ponds. A mother and child were walking by a few moments later and I pointed out the frogs to the mother who pointed them out to her son who became wildly excited. I have to say that I really admire all the educational activities the Garden offers children…and there are a lot to choose from. A great place to finish up your visit to the Atlanta Botanical Garden is the Alston Overlook. At the highest point in the Garden, you have an incredible view of the Garden and the Atlanta skyline from either of the two bench swings. 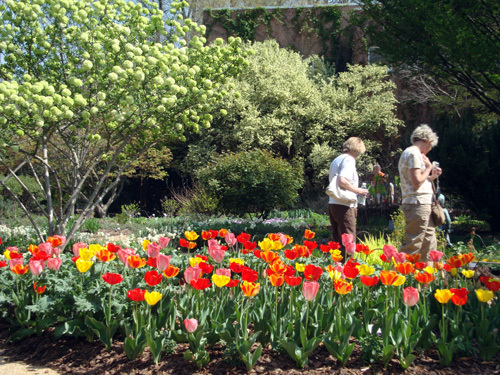 Membership, membership, membership…if you're a local and have even the slightest interest in gardening, botany, or respites from the city, I highly recommend investing in a membership to the Atlanta Botanical Garden. In some cases, it pays for itself in only a couple of visits. In the past seven months I've visited the Garden eight times…which translates into a significant savings for having purchased a membership. You also have the option of visiting and making your decision on your way out of the Garden. On a same-day visit, you can have the price of your admission applied toward the purchase of a membership. Guided group tours are available for groups of 10-50 for a modest amount above regular admission price. Box lunches are available for groups (order 48 hours in advance) through MetroFresh in the Garden. Exhibition tours are available every morning at 10:00 a.m. The current exhibition tour is Orchid Daze: Liquid Landscapes, available through Saturday, April 9, 2011. These tours are free with admission and begin in the Hardin Visitor Center. Every Tuesday and Thursday at 1:30 p.m., docent-led Garden tours begin in the admissions area and are free with admission. ﻿ And the piece de resistance of tours is the Gardens for Connoisseurs Tour. 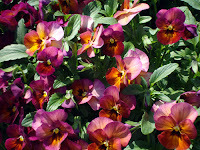 It takes place on the Garden's busiest day of the year, Mother's Day. 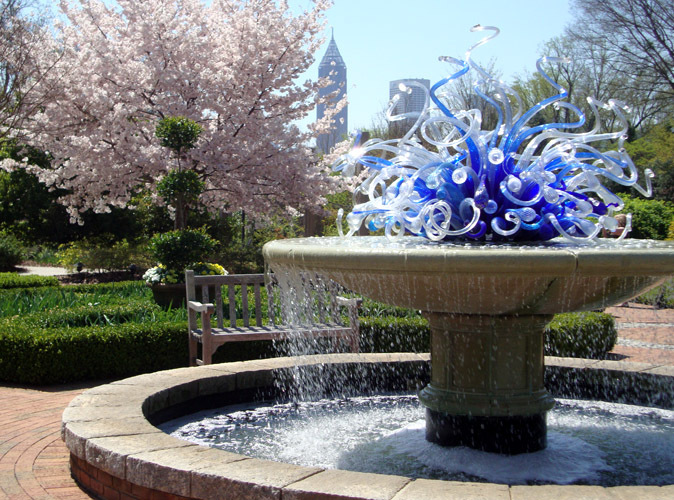 Tour-takers visit eight amazing private gardens around Atlanta and finish with a visit to the Atlanta Botanical Garden. 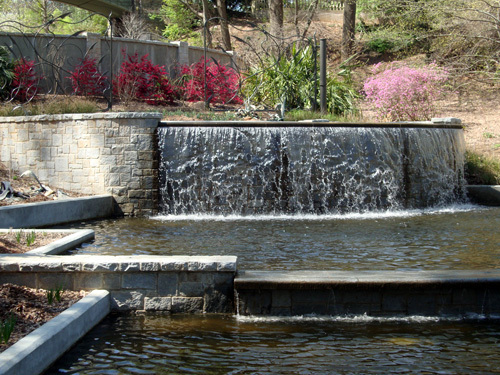 You already know the answer to the question of will I return to the Atlanta Botanical Garden…it's of course "Yes!" I'm a city person, but I also love nature, so the Atlanta Botanical Garden has become a favorite place in the city…I have others, of course, but even after visiting for 24 years, this Garden remains a special place for me. The Mrs. and I took the tour today. Very great day, very fine gardens.